Large, light family apartment in Calafell on the Costa Dorada,. Convenient for shops, bars, restaurants and trains. Bustling nightlife and marina a 10 minute walk away. Barcelona, Tarragona and Sitges within easy reach by rail or car. Portaventura theme park 30 minutes away by car or rail. Magnificent scenery inland for visits to the wine growing areas of Penedes and Priorat or cultural tours of the monasteries of Poblet and Santes Creus. The large and clean sandy beach is safe for bathing and has lifeguard cover in July/August. Possibility of renting catamarans, pedaloes, windsurf and SUP board equipment. Bikes can be hired in Calafell. I live in Barcelona with my family and this holiday flat belongs to my mother. We are a mixed Anglo-Spanish family. I have been renting out the property for about 8 years. I work in the export department of a Spanish company in Barcelona. Sitting on the terrace and looking out to sea is such a fabulous way to relax after a busy week in Barcelona. The beach lends itself to numerous activities such as an early morning dip,walking, cycling and jogging along the sea-front. Location and the Mediterrean. We are privileged to enjoy such a wonderful climate and have the luxury of sitting and admiring such a fantastic view. En suite bathroom to bedroom 1 with bath/shower over, wc, wash basin, bidet. Bathroom with shower, wc, wash basin, bidet. Large lounge/diner with dining table seat 8. 3 seater sofa, armchair, TV, DVD, wi-fi, video, CD and radio. Fully equipped kitchen with 4 ring gas hob, electric oven, microwave, fridge/freezer and dishwasher. Kettle, toaster, coffee maker, iron and ironing board. Notes on accommodation: Suitable for children. Possibility of hiring bikes. Utility Room: Washing machine, sink, dryer and gas boiler (constant hot water, heating). Cleaning / Towels / Linen / Maid service: Towels and linen are provided but not changed. Beach towels are not provided. Other: Large balcony/terrace overlooking beach furnished with table and chairs. Suitable for eating or lounging. 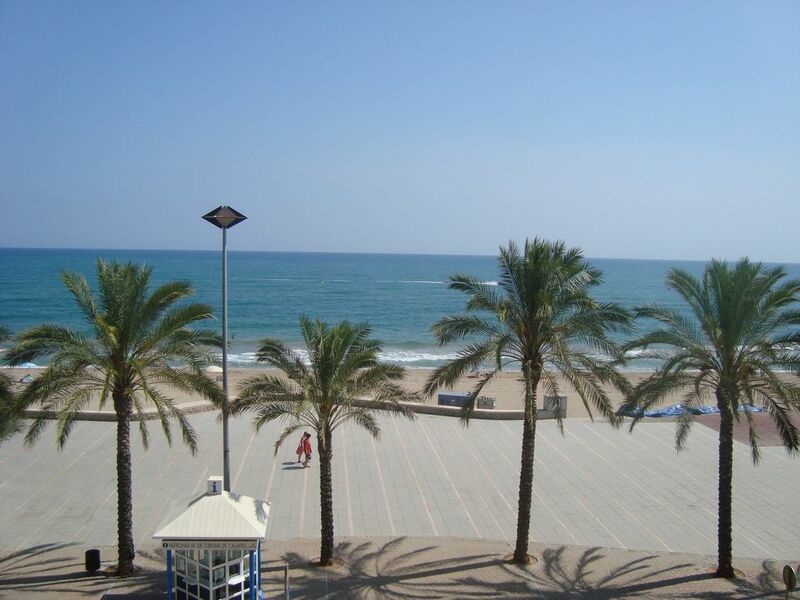 Ideally situated across from the sandy beach in Calafell. The apartment is very well equipped and is in the ideal location for a beach holiday. It is situated at the quieter end of Calafell but within a 15 minute walk of the main shops, excellent restaurants and bars. The spacious balcony is perfect for dining and the kitchen, although small, has everything one would need if entertaining at home. The bedroom at the front, with balcony and large en suite is a lovely room. There is also a shower room servicing the other two double bedrooms. There is plenty of free parking in the vicinity of the apartment building and we were lucky enough to be able to park immediately outside for the whole week. A very comfortable apartment in a great location. We have just come back from another visit to Calafell and this apartment. The apartment is slowly being updated but is very comfortable with a beautiful view of the sea although don't expect it to be 4/5 star. This year was a little different for us as building work was being undertaken to improve the exterior. The owner did email me to let me know that this work, which should have been finished by the beginning of May, was still in progress; she has kindly offered a refund of some of the cost due to the fact that we couldn't use the apartment to its full advantage. As we left they had just started to replaster to exterior wall and looked as if they had almost come to the end of this work. The owner is very accommodating and friendly. I can thoroughly recommend this accommodation which is central to both the town and the harbour areas. The railway stations at Calafell and Segur de Calafell are about 20 minutes walk way. Our favoutite restaurant, Monsoon Beach, is a steady 15-20 minuted walk and offers a varity of food from Indian to Italian, English to Spanish. Piso grande cn todas las comodidades!! Muchas gracias - estoy muy contenta que les haya gustado. Safe, family sandy beach with lifeguards in attendance during July and August. Suitable for small children. Sun loungers and umbrellas can be hired. Catamarans and pedaloes for hire. Marina within walking distance. Barcelona and Reus airports 35 miles away. Direct rail connection to central Barcelona. Car hire recommended for trips to the countryside. Calafell is small seaside town with historic part inland. Sitges is a very pretty seaside town 20 miles away. Barcelona is 1 hour away. Tarragona with its extensive Roman remains and Medieval centre is also well worth a visit and is 25 miles away. The Priorat area is an hour's drive away and has both stunning countryside and fantastic wine. The charming village, Siurana, is fun to visit. Penedes has a number of very famous vineyards offering tours and is the region of Cava. Cancellation policy: 100% of deposit returned up to 60 days prior to start of your holiday. After that a mínimum of 50% of total will be reimbursed depending on reason for cancellation.